Humans made use of pesticides to kill pests infesting crops. This was done to increase agricultural yields and improve public health. Pesticides however turn out to be damaging for the environment, causing many harmful impacts. 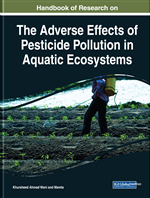 Certain pesticides after being applied to the environment show long-term residual effects while others show acute fatal effects particularly to aquatic life. For example, organochlorine pesticides are persistent in the environment; as a result of this, these pesticides find their way to contaminate ground water, surface water, food products, air, soil, and may also affect human beings through direct contact. Pesticide exposure to humans has been found to be an important cause of some diseases such as cancer, respiratory diseases, skin diseases, endocrine disruption, and reproduction disorders. It is this aspect of pesticides in the environment that has raised concern among environmental scientists to study their behavior in the environment and then come out with a sound alternative so as to rescue the human population from their adverse effects. Fifty years (half a century) after Rachel Carson's warning to the world about the devastating effect pesticides have on birds and beneficial insects, pesticides continue to be in use. Continued usage of pesticides can be described as a massive chemical assault on our environment which threatens the survival of many birds, fish, insects, and small aquatic organisms that form the basis of the food web. More generally, pesticides reduce species diversity in the animal kingdom and contribute to population decline in animals and plants by destroying habitats, reducing food supplies, and impairing reproduction. Organisms in ecosystems exist in complex interdependent associations such that losses of one keystone species as a result of pesticides (or other causes) can have far reaching and unpredictable effects. A keystone species is a species that is disproportionately connected to more species in the food-web. The many connections that a keystone species holds mean that it maintains the organization and structure of entire communities. The loss of a keystone species results in a range of dramatic effects that alters trophic structure, other food-web connections, and can cause the extinction of other species in the community. A pesticide may eliminate a species essential to the functioning of the entire community, or it may promote the dominance of undesired species or it may simply decrease the number and variety of species present in the community. This may disrupt the dynamics of the food webs in the community by breaking the existing dietary linkages between species. Water can be described as one of the most priceless gifts of nature; as a result it is also termed as the lifeline of earth. Evolution of life and beginning of human civilization would not have been possible without it. Throughout the history of humans, social and economic development of civilization has been closely related with the availability of sources of water. The world population has shown a tremendous growth with the volume of water remaining the same, this increase in population has lead to over exploitation of water resources particularly post industrialization. Due to the impact of human activities, environmental disturbances on the water cycle have also increased (McMichael, 2009). Many factors such as unplanned urbanization, population explosion, and deforestation have caused pollution crisis on earth. Industrialization results in problems of pollution to lithosphere, hydrosphere and atmosphere based on the type of industry, the nature of raw materials, processes involved and types of equipments used (Hodges et al., 1973). Most of the water bodies that are located in and around human settlements have been polluted by industrial effulent, which come out of different factories. All the chemicals of the industrial water are toxic to all forms of aquatic life ranging from minute organisms to giant fishes. Among the most prominent pollutants that have rendered aquatic resources polluted and caused huge damage to aquatic organisms are pesticides. Pesticides may be described as a mixture of substances which can be of chemical or biological origin, used by human society to mitigate or repel pests such as bacteria, nematodes, insects, mites, mollusks, birds, rodents, and other organisms that affect food production or interfere with human welfare. They usually act by disrupting some component of the pest's life processes to kill or inactivate it. Pesticides also include substances such as insect attractants, herbicides, plant defoliants, desiccants, and plant growth regulators. Phytoplanktons: Phytoplanktons are minute organisms of lakes, streams, and oceans that make their own food from sunlight through photosynthesis. Phytoplanktons occur almost anywhere there is water and sunlight. Pesticide: A pesticide is any substance used to kill, repel, or control certain forms of plant or animal life that are considered to be pests. Aquatic Animal: An aquatic animal is an animal that lives in water for most or all of its life. Aquatic animals may breathe air or extract oxygen from that dissolved in water through specialized organs called gills, or directly through the skin. Zooplankton: Zooplankton is the common name given to many small species of animals found in fresh and marine waters throughout the world. The word zooplankton , derived from Greek, means “wandering animals.” They float in the water column and drift with the currents.